The man, the myth, the legend ... back in the 80s Jesse Rae, along with Roger Troutman and Bernie Worrell, was part of the P-Funk movement that was hugely influential to Detroit’s early electronic experiments. 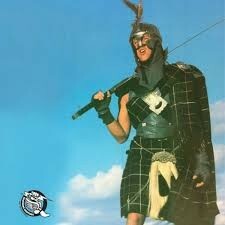 Lesser known is that the enigmatic Scot-funk warrior later produced underground electronic tracks in the 90s. The inaugural release on Glasgow label Southside Shufflers presents two of Jesse’s Shufflers on vinyl for the first time on the Global 95 EP- a sampler from his pioneering 1995 album ‘Compression’. Ever the innovator, Jesse recorded the album collaboratively using live ISDN technology spanning three continents, with the resultant tracks fusing African, US electro-funk and old Scots influences. 23 years later, Jesse’s under the radar Shufflers sound more relevant than ever. Southside Shufflers are a record label and sports collective based in Glasgow with outposts in London and Amsterdam. SSS- ain’t no half steppin’!